600 Main not only offers the comforts and cuisine of today but is also filled with a rich history dating back to the 1800s. For all of the nearly 120 years that it has occupied its elegant, tree-lined block, the house has stood out as both an exquisite example of period architecture, and a reminder of Toms Rivers’ historic roots. The house was constructed in 1898 for a local businessman, and was quickly recognized as an outstanding example of Colonial Revival architecture. However, because of its lavish oversized windows, grand porch and detailed ornamentation, it appears distinctively Victorian, and the flavor of that era has been maintained at the charming old house ever since. Soon after its construction, the house was bought by the man who later loaned it its nickname, the Mathis House. 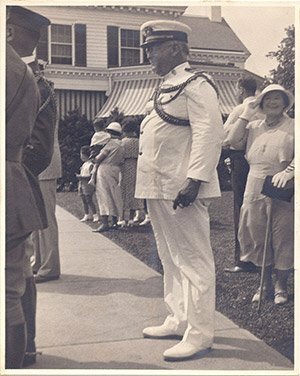 Thomas A. Mathis, also known as Captain Tom for his many accomplishments on the seas, resided in the house through a political career that spanned some 50 years. Mathis, born in 1869, resided in New Jersey for almost all of his life. But in his early years, following in his father’s footsteps, he sailed the world. He was a master seaman at 18 and served as second officer aboard J.P. Morgan’s yacht, “Corsair,” on its first round-the-world cruise in 1905. All his life he maintained yachts and ties with the seas. Because of that, Toms River was the perfect place for him to settle down. Mathis and his wife, Helen S. Steelman, purchased the house with his brother-in-law, Maja Leon Berry and his sister-in-law, Edna Steelman, in 1912. During the two couples’ occupancy, the house was the scene of many elegant parties and dinners. 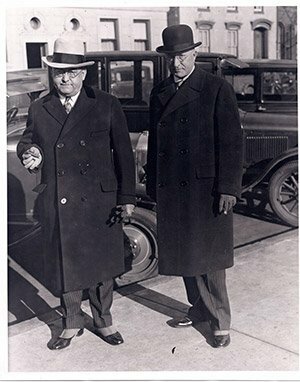 Mathis involved himself in the automobile business in Philadelphia and Toms River and in real estate in New Jersey, but his preoccupation – and occupation – became politics. By the time he bought 600 Main, he had already served the state and its residents in civic roles for a decade. He was appointed to the New Jersey Senate in 1909 and went on to be re-elected for a half-dozen more terms, rising to become Republican majority leader, then president of the Senate in 1929. In 1931 he was appointed Secretary of State of New Jersey, and served in that position until 1941. Through all that time, he was a kingpin of Republican Party politics in Ocean County. Mathis died in 1958, but his name remains well known – not just because of the beautiful old house he left behind. The Thomas A. Mathis Bridge, part of Route 37, spans Barnegat Bay and connects Toms River with Pelican Island and Seaside Heights. Many a vacationer and sea lover has delighted as they traveled the bridge, over the gleaming bay waters, toward recreation, fun and seaside memories. Mathis was skillful at sewing, crocheting and knitting – hobbies he came to enjoy after spending so many years alone at sea. The Ocean County Historical Society possesses one of the quilts he made at sea from materials garnered in foreign ports. The old house has passed through various hands, until Sue and John Notte purchased it in 2012. By then the house was in need of some tender loving care, which the Nottes gave generously. Their dream was to turn it into a center of relaxation and hospitality – which is exactly what it has become.